I’ve been rather quiet this month since I have no pretty photos to show off…well, a couple, I should blog those later. For now, this is my monthly yardage post. So while my yardage was decent, it was not what I had been hoping for. My first week of the month was fabulous and almost as much as the next three weeks I knit. Though I did have a slump, so that considered, I didn’t do poorly at all. I had really been hoping for a mile a month for the rest of the year. Oh well, do better next month, right? I get to do a new cast-on, which will cheer me up. The dreaded Knitting Blahs. I’ve already ripped my “Glee.” Just wasn’t feeling it. At the moment, I’m not really feeling anything. I want to knit, but nothing is appealing. Knitting slumps are the worst. What you see is my frogged Viking Cable CPH. Well, all of it minus the back panel, which has been steeked and framed to become wall art. I could not bear to rip that part out. 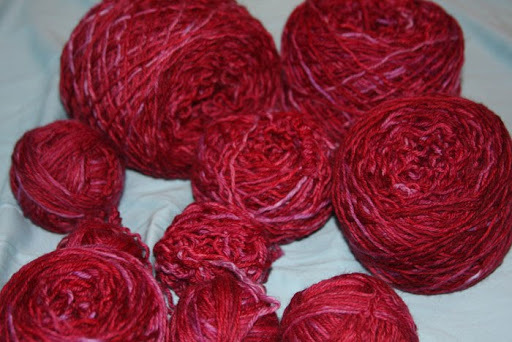 This is ~800yds of MadTosh Worsted Cherry. I realized that had I focused on knitting for as long as it took me to rip this out, I would have gotten a lot done. This had been seamed. All the ends were woven in. It was a nightmare. No exaggeration. There was swearing. I tossed it on the ground in frustration at one point. But something felt right about frogging today, so after 6 months of sitting in my closet, neglected in a bag, it saw some natural light. Now, I believe it is time to cast it on just as quickly. I can not bear to have this yarn back in stash and I do not want to have it unused for forever. I think I’m going to make a modified Glee. (ravel it!) If you look at the examples, I plan to make an open deep V-neck. I will not be putting closures on. I hope I have enough to do this; I’d be very sad if I didn’t. I already know I’m going to be in end-weaving hell when I’m done, since so much of this is in smaller balls. When I said it was a nightmare to rip out the CPH, I meant it. In one spot, I couldn’t find the tail for the seaming yarn at all and had to guess & snip. Took me a couple of tries to find the correct one. WHOOPS. Other then that, no real big project work. I knit a couple of hats since my last post and I’ll get pictures up eventually. The weather has been very rainy and dreary here, which I usually love, but for some reason wasn’t agreeing with me today. However, I ADORE the lower temperatures it brought. I wish it would be in the 70s every day. But I know that realistically, it will not happen until November, which makes me a sad little bunny. I’m not a hot weather kind of gal. Trying my hand at designing once again. The hat I knit yesterday was from a highly variegated skein of Yarntini sport which I could not destash and decided to get some use out of. The hat used just under 1/3 of the skein. I cast this on and I’m writing down what I’m doing as I go along. Most armwarmer/fingerless glove patterns are written from the arm down to the hand. Which is nice, if one has smaller arms and doesn’t need to fiddle which huge decreases. Or if one isn’t working with a very limited quantity of yarn and she’s unsure of just how much it will take for each glove. I’d rather cut the arm a bit short then run out before I get to the bottom of my hand. So far, it’s been pretty easy. It took me a minute to figure out how to make the thumb hole. What I did is looking nice and I’m on my merry way. I have plans to nip in the wrist with some more ribbing and then do some serious increases to fit up my arms. I’m still deciding if I want to leave the thumb as-is, or pick up stitches and knit a little thumb sleeve. So far, the color is pooling rather then striping, but I have hopes that once I cast on more stitches to go up the arm, that will resolve itself. I’m surprised I haven’t succumbed to the siren call of arm warmers before now, since they seem to be perfect for me. I hate having cold arms, but I hate having a cuff or ribbing hit my wrist area even more. If it goes down over my hand, I’m fine. But anything binding my wrist up to my elbow is no good at all. I might eventually get enough yarn to do a nice long pair all the way up my arms, and I have sketches laying around for a sweater with built in fingerless gloves. Which the Husbeast would hate, but I would love. I should find that sketch and look at making it a reality. All in all, a pretty good month. I would have just broken the 1 mile mark except that I had to deduct out for a frogged project. C’est la vie. I did succeed in reducing my projects on needles this month, though it was through frogging and hibernation, not actually finishing them all. 3 of the 4 FOs I have this month are new cast ons. Though, I have only two active projects on needles for the time being, while I decide what I want to do with the hibernating ones.